The injuries will give other players the chance to shine and Williamson is expecting youngster Kevin Roberts could be just the man to fill the midfield role alongside Mark Hughes as City entertain Barnet on Tuesday night. On a brighter note both John Murphy is hoping to be ready for tomorrow night’s match after picking up an injury in the 2-1 defeat at Bradford City. James Vaughan is now fit and striker Nathan Lowndes has recovered from a knock picked up at the Racecourse. Despite a seventh minute goal from Chris Holroyd the reserves were held 1-1 at home by Burnley last night in a Pontins Holiday League game. It was the second match this week for the second string who lost 3-1 at home to Morecambe in a League Cup match on Monday. City had to be content with a point from a well fought derby match at the Racecourse despite taking the lead twice in the opening period. A spectacular goal from Kevin Roberts sent the 2,000 away fans wild on 27 minutes only to be silenced with a Michael Procter equaliser on 37 minutes. A lengthy delay due to an injury to Tony Dinning, which saw him replaced by Tony Grant, resulted in five minutes stoppage time in the opening period during which Paul Linwood headed the Blues (for some reason playing in yellow) back in front. They held the lead, despite having to reshuffle after two more forced substitutions, until 15 minutes from time when Procter volleyed home his second goal of the game. Before that second equaliser City had created but failed to take several half-chances with Richie Partridge, Kevin Ellison and Paul McManus all testing Anthony Williams in the home goal. Tony Dinning, Tony Grant and Nathan Lowndes all hobbled off during the game which forced manager Bobby Williamson into changing the system on more that one occasion. Following the draw City drop one place to seventh in League Two. The Blues have no match next weekend, which is FA Cup second round day, so the physio staff have a few extra days to get the injured players ready for their next match which is at home to Barnet on Tuesday 4 December, kick-off 19:45. Chester have sold their full ticket allocation for Sunday’s derby at Wrexham and will be backed by about 1,900 fans at the Racecourse. The Blues go into the match on the back of a three game losing streak and will be looking to regain the form that has seen them pick up six victories away from Deva Stadium so far this season. A victory at the Racecourse Ground is long overdue, you have to go back to 1978 when City last tasted victory, on that occasion Ian Mellor and Ian Howat gave Chester a 2-1 victory in front of a crowd of just over 19,000. There has been a 2-1 FA Cup win in the snow of January 1987 and a 3-1 victory in the Freight Rover Trophy two months later with no wins since. Chester have only won ten of the last 42 derbies, while Wrexham have won 20. Wrexham will be playing their first game under new manager Brian Little. Little, who celebrates his 54th birthday on Sunday, is expected to include former Chester winger Sam Aiston in his squad after the winger signed on loan from Northampton Town yesterday. Mark Jones and Danny Williams are still out while striker Neil Roberts and defender Shaun Pejic are battling to be involved. For Chester, centre back Paul Linwood is included in the squad after being substituted at half-time in last Saturday’s 2-0 home defeat against MK Dons with blurred vision. Midfielder Mark Hughes is available for selection after serving a one game suspension, but striker John Murphy remains a doubt with a knee injury. A special rail service from Chester to Wrexham will operate on Sunday. The train will accommodate 650 people and will depart Chester Station at 10:30. The return journey will leave Wrexham at 14:38. The youth team have progressed through to the third round of the FA Youth Cup after winning their second round tie at Curzon Ashton 6-5 on penalties. The game had ended 1-1 after extra time in front of 146 spectators. Andy Mitchell scored City’s equaliser and the Blues now entertain York City in round three on Wednesday 12 December, kick-off 19:00. Admission will be £3.00 for adults and £1.00 for children. Midfielder Glenn Cronin has been released by Chester. 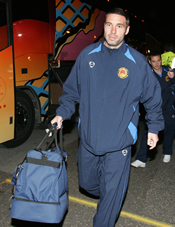 He signed for Chester in July 2006 from Exeter City but broke a metatarsal in the pre-season and has made just 1+3 appearances in a first team shirt. According to the club chief executive Bob Gray, John Hartson has rejected a loan move to Chester before tomorrow’s temporary loan transfer deadline. Chester chief executive, Bob Gray, said an agreement had been made with West Bromwich Albion for the loan to go ahead but the player didn’t want to drop to League Two. Chester have made enquiries to West Bromwich Albion regarding taking their experienced Welsh international striker John Hartson on loan. The Baggies have yet to respond to City’s enquiries for the 32-year-old striker who has just completed a loan spell at Norwich City where he made 2+2 appearances. Hartson joined West Brom in June 2006 and has scored 6 goals in 16+8 appearances for thee Black Country side. Blues manager Bobby Williamson blamed missed chances as his side lost 2-0 at home to Milton Keynes Dons on Saturday. However City faced a visiting French goalkeeper in Willy Gueret who was on top form, with several outstanding saves including one from Simon Yeo’s penalty and another from Kevin Ellison moments later late in the second period as City tried to claw their way back into the game. The visitors controlled much of the play in the opening period and took the lead on 34 minutes through Mark Wright. City had to adjust things after having to replace defender Paul Linwood at the break who was suffering from blurred vision. City had much the better of the play after the break but just as they seemed to be getting close the Dons doubled their lead on 64 minutes though Jemal Johnson who tucked the ball home off the post after Dyer had outpaced Richie Partridge before cutting in and crossing for Johnson at the near post. City were handed a lifeline 13 minutes from time as goalscorer Wright was adjudged to have handled in the area. Substitute Yeo, who’d only been on for two minutes, stepped up but saw his shot well saved. Yeo and Murphy both missed chances as City’s poor home form, where they have won just two games in eight, continued. The defeat drops Chester to sixth place in League Two. After the defeat Williamson said: “We dominated in the second half and created good chances, but on the day we couldn’t put them away. If you don’t take your chances your not going to win and that’s what happened. The shots we hit, we hit at their keeper and we made it look easy for him really, and that was disappointing. Despite a goal from Lloyd Ellams the youth team were beaten 2-1 at home by Tranmere Rovers on Saturday. The defeat drops the team to 14th in the Youth Alliance North West Conference. City manager Bobby Williamson is hopeful that striking duo John Murphy (left) and Richie Partridge will both be fit to return to the side for the visit from League leaders Milton Keynes Dons tomorrow. Both missed last weeks FA Cup defeat at Bradford City as the Blues struggled to break down a dogged home defence for most of the match. Chester will definitely be without midfielder Mark Hughes who serves a one match ban after picking up five yellow cards. Like City, the Dons have lost just once on their travel this season, at Rochdale, and currently lie four points clear of Chester. Dons Manager Paul Ince returned to his former club Macclesfield Town this week to capture the loan signing of Jordan Hadfield, he will be available to play tomorrow. Former Chester player Drewe Broughton makes his first return to Deva Stadium since leaving for Boston United just over a year ago. A new football magazine has recently been launched. 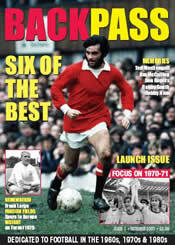 Backpass, will appear quarterly and is dedicated to football in the 1960s, 70s and 80s. Memories of Ted MacDougall, Jim McCalliog, Don Rogers, Bobby Smith, Bobby Ham, Mick Kearns, Mark Loram and Geoff Crudgington. Issue 1 is now available for £2.50 and more details can be found on the magazine website. The reserve side suffered their third defeat on the run last night when they were beaten 2-0 at Blackpool in a Pontins Holiday League match. Tickets for the match at the Racecourse Ground on Sunday 25 November (KO 12:00) are currently still on general sale at the following times. Tickets for the Eric Roberts stand are priced at £16.00 (adult), £10.00 (OAP), £5.00 (junior). Tickets are also available by post. You should send your cheque, made payable to ‘Chester City Football Club’ indicating which ticket(s) you are ordering to The Secretary, (Wrexham Away), Chester City FC, The Deva Stadium, Bumpers Lane, Chester, CH1 4LT. City were knocked out of the FA Cup at the first round stage on Saturday when they suffered their second defeat at Bradford City in five days to miss out on a second round home tie with local rivals Tranmere Rovers. As feared both Richie Partridge and John Murphy were missing from the Chester ranks through injury and both were missed as City struggled to break down a home side that defended in numbers having been reduced to ten men for half of the match following a red card for Guylain Ndumbu-Nsungu for a second bookable offence. The only goal of the game came on 28 minutes as Peter Thorne headed home unchallenged Paul Evans’ right wing cross in front of over 600 travelling fans. Manager Bobby Williamson was disappointed with the performance blaming the defence and midfield for not getting behind the Bantams rearguard. Williamson said: “Richie Partridge and John Murphy were obviously missed – we can’t afford to be without big players like them. I think it was obvious that we missed Richie and John. We ask a lot of Richie when he’s performing well. He’s a handful, he troubles defenders, and we haven’t got anybody else like him. Everybody else we’ve got in the team duck back out, come back behind their man and roll the ball back to a midfielder or full back, but we want them to go at people and be positive, but we’ve not got such a player as that. We’ve got depth and we’ve got players that are capable and who have got potential that has yet to be fulfilled. We’re hoping for big things from players like Paul McManus and Paul Rutherford. But it’s not down to them that we got beat. I felt from midfield on, and even our full backs, didn’t get behind Bradford at all. City must pick themselves up for another tough encounter on Saturday when table topping Milton Keynes Dons visit Deva Stadium, kick-off is at 15:00hrs. Goals from Lloyd Ellams and Stephen Thorpe gave the youth team a 2-1 win at Macclesfield Town on Saturday. Defender Sean Hessey has joined Macclesfield Town on a two month loan deal with the view of a permanent contract at the end. Hessey has not played for the first team this season but made three appearances for the reserves. Chester could be without both Richie Partridge (groin) and John Murphy (knee) through injury as the Blues return to Bradford City tomorrow for the first round of the FA Cup. Both players were injured in Tuesday night’s encounter between the two sides. Youngsters Paul Rutherford and Kevin Roberts replaced the duo in midweek and both may be in contention again after turning in solid performances as City lost their unbeaten away run. The Bantams will be without on-loan midfielder Nicky Law as Sheffield United have not given him permission to play in the FA Cup. The winners of the first round tie will pick up £16,000 prize money. The draw for the second round will take place on Sunday after the live televised game between Torquay United and Yeovil Town. The youth team won 4-0 at Marine last night in the first round of the FA Youth Cup. City's goals were scored by Kieran Morrin, Glenn Rule, Paul McManus and Andy Mitchell. Their reward is another away tie in round 2 at Curzon Ashton. The match will take place at 19:30hrs on 21 November. Curzon Ashton won through against Chesterfield 7-6 on penalties after the two sides had drawn 1-1. A 2-1 defeat at Bradford City last night brought to an end City’s unbeaten away run and saw the Blues drop to fourth in League Two. John Danby saved a Nicky Law spot-kick early in the game before the home side took the lead through John Danby saved a Nicky Law spot-kick on 36 minutes. Chester had a great chance to draw level just after the break with a penalty themselves but Tony Dinning saw his spot-kick saved. Despite dominating for most of the second period City rarely threatened to score and the home side doubled their lead two minutes from time as Alex Rhodes ended a mazy run with a goal from a narrow angle. Kevin Ellison scored a stoppage time consolation for Chester who must now pick themselves up for a return to Valley Parade for Saturday’s FA Cup clash. Both Richie Partridge and John Murphy picked up knocks and were substituted during the game. It remains to be seen if they will be fit for Saturday. Manager Bobby Williamson reflected after the defeat: “I felt we did enough to get something, but it never happened for us and obviously we are disappointed. We'll go away and lick our wounds and we come back here on Saturday. I thought Bradford started better than us and we were chasing the game at times. We never passed the ball as well as I would have liked. We had to change it and we had to change the shape at times as well and at the end we even pushed the full backs further forward. City make their first trip to Valley Parade for 13 years tonight looking for a win that could take them top of League Two should MK Dons drop points at home to Grimsby Town. City, who notched their sixth away win of the season on Friday night, have no fresh injury worries as they prepare to face Bradford twice in a week with Saturday’s FA Cup clash to follow. Home manager Stuart McCall is under pressure as his side, who were relegated last season, have got off to a poor start and have now gone eight games without a win and lie 21st in League Two. Despite their indifferent start, the home fans still turn out in numbers with over 13,000 at Saturday’s 2-1 home defeat by Brentford. McCall may have to do without the services of Ndumbu-Nsungu who is struggling with fitness, so Peter Thorne and Barry Conlon may start up front for the Bantams. City remain second in League Two following the weekend’s results. MK Dons top the division but only now by a single point after today’s 1-1 draw at Wycombe Wanderers. The Blues continued their fine away form with a 1-0 win at Lincoln City on Friday night, but they are sure to find themselves in hot water with the Football League, after turning up at Sincil Bank 35 minutes after the scheduled 19:45 kick-off time having been stuck in traffic. It took a controversial second-half penalty following a challenge on Chris Holroyd to secure all three points, Tony Dinning converting the spot kick on 57 minutes. The home side also had a goal disallowed later in the game. Manager Bobby Williamson said: “It took us a bit of time to get started, Lincoln came out of the traps flying as you would imagine with a new manager, they were certainly very impressive, I think we may be fortunate to come away with the three points. The pitch looked a bit treacherous at times and a lot of people were sliding about out there and I think our boys hurt themselves out there as the pitch was very hard. City now face two trips to Bradford City, on Tuesday night for a League Two clash and again on Saturday when the two sides meet in the FA Cup. Tickets for the match at the Racecourse Ground on Sunday 25 November (KO 12:00) will go on sale on Wednesday 7 November at the Deva Stadium ticket office (10:00-16:00) for Season Ticket and TRUEBLUE card holders only. From Thursday 8 November they will go on general sale at the following times. Chester take their impressive unbeaten away record to Lincoln City tonight facing an Imps side that are bound to be buoyed following the appointment of new manager Peter Jackson during the week. Jackson, a former Deva favourite replaced John Schofield, who was sacked along with director of football John Deehan earlier this month. He has taken on a side who lie bottom of the Football League with just nine points from their opening 13 matches. Their last win came on 25 August with a home victory over Accrington Stanley. City boss Bobby Williamson should be able to include former Imp Simon Yeo, Nathan Lowndes and Tony Grant to his squad after all three, having recovered from injury, took part in Wednesday’s 5-0 reserve defeat.